Yes, You can stop an email from being sent after clicking on the send button. Sometimes, Just after clicking on send button after composing an email, we suddenly remember that we have forgotten to add something to mail. But nothing could be done to stop emails.For this kind of situation, you can follow this tip to stop email and then add that thing which we forgot to add and send it again. But all this is possible only in Gmail in which it shows an undo button for few seconds after sending an emails. Do not go and find out this feature in your Gmail because this option is not there by default, you need to add this undo button to emails from settings. Step 1: Login in to Gmail account. Step 2: Now click on Gear icon at the top right side of the page and click on settings. Step 3: Now in the settings page, click on labs tab. Step 4: Gmail Labs contains some experimental features of Gmail. Here, in the search box, write “Undo send” and search. Step 5: In search results, you will see “Undo send” by Yuzo F. To enable this feature, click on Enable at the right side and then save changes. Step 5: Send a mail and see the Undo button for few seconds after sending the mail. You can only stop an email from being sent within few seconds. It means you need to respond quickly if you really want to stop email sending. It is because it only waits for a limited period of time. After that, your email will be sent. 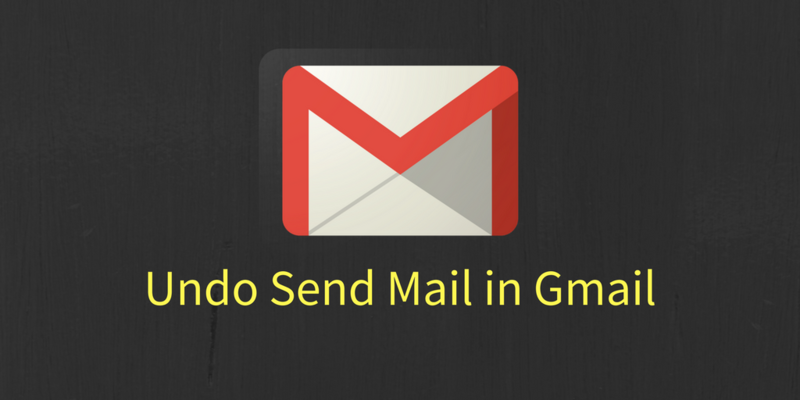 How Undo Send in Gmail Works? Working of this feature is simple and easy to understand. After adding this to your Gmail, it always waits for few seconds after clicking on the send button. When you click on send button, it waits for user’s response for few seconds and holds email. If it found no response or action on undo button, it then sends the email to recipients.